On October 31, a man intentionally drove a rented a rented pick-up truck for about a mile on the busy Hudson River Greenway in Lower Manhattan, fatally striking eight trail users and injuring 11 others. It was the second time a driver weaponized his vehicle in New York City this year — in May another motorist drove his car down a Times Square sidewalk, killing one person and injuring 22 others. As I wrote shortly after the first attack, while local authorities should take sensible precautions to prevent vehicle attacks from happening in Chicago, everyday traffic violence is a much more pressing concern. In 2015, the latest year for which the Illinois Department of Transportation has released data, 119 people were killed in Chicago traffic crashes. Another 21,667 people were injured — about 59 people a day. In contrast, there seems to have been few, if any, cases of motorists intentionally striking random people with their cars in our city. The good news, as Streetsblog USA contributor Yonah Freemark noted in a recent New York Times op-ed, is that we can help prevent and mitigate vehicular homicides through the same urban planning strategies that can reduce the incidence of everyday traffic violence. The Times Square attacker came to a stop when he struck struck metal bollards. Retractable posts should be installed at the entrances of all bike/ped trails where it would otherwise be easy for motorists to intentionally or accidentally enter the path. Vehicle-resistant bollards, benches, planters, and the like should be installed on the perimeters of all popular pedestrian spaces, as is already the case at Chicago’s Daley’s Plaza, to block both reckless and murderous drivers from leaving the street. Moreover, Freemark noted, we can make high-speed vehicle attacks more difficult through general strategies to deter speeding and make our streets more people-friendly. These include “road diets” that convert mixed-traffic lanes to space for pedestrians, transit, and bicyclists, as well as traffic-calming approaches like sidewalk bump-outs, speed bumps, speed feedback signs, traffic cameras, and more. In the wake of the recent greenway attack, I’ve been asked if I believe pedestrians and cyclists are at risk of vehicle attacks on busy Chicago paths like the Lakefront Trail and the Bloomingdale Trail, aka The 606. All entrance ramps for the Bloomingdale have steel bollards to prevent entry by unauthorized drivers. 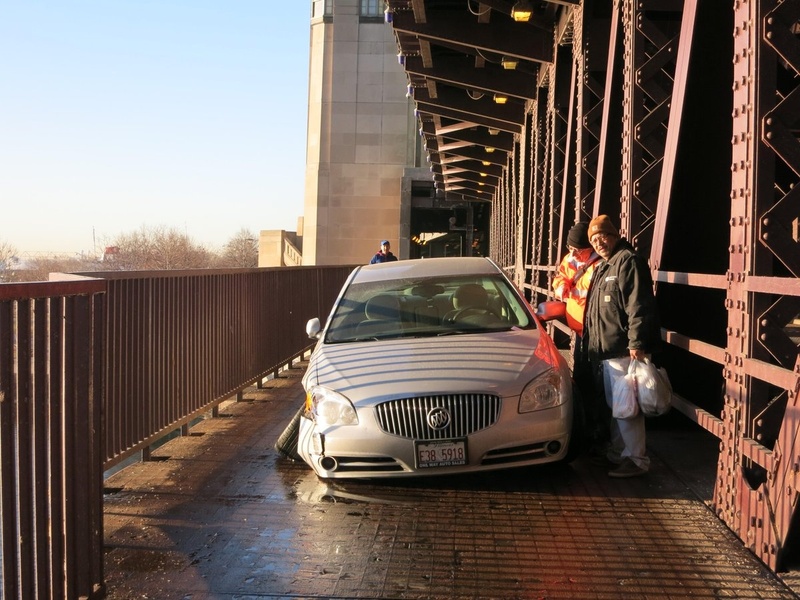 But there have been cases of confused motorists wandering onto the Lakefront Trail and striking people, as well as drivers crashing onto the path from Lake Shore Drive, so more physical protection for trail users is needed. That’s especially true now that the Chicago Park District’s project to separate pedestrian and bike traffic on the shoreline path is building new trails, usually for cyclists, closer to the highway. In some cases the new path is only a few feet from the high-speed roadway with no protection but a flimsy wooden snow fence. In recent weeks there have been two cases of motorists leaving the drive and crashing near the Lakefront Trail. Fortunately advocates, including the Active Transportation Alliance and the Chicago Area Runners Association, have flagged the issue, and the Chicago Park District has promised to take action. As Active Trans reported last week, after meeting with the two advocacy groups, park district officials said they would try to get a guard rail installed wherever the path is within 30 feet of the drive. The park district currently in talks with the Illinois Department of Transportation to identify a funding and installation strategy. How about hitting up hedge fund billionaire Ken Griffin, the guy who previously donated $12 million to make the separation project possible? The bottom line is that while Chicago trail users shouldn’t live in fear of an intentional vehicle attack happening on a local path, local authorities should do everything they can to prevent all types of traffic violence. That includes installing more physical protection for paths, as well as building more physically protected on-street bike lanes. Not just accidentally, either – last week (or maybe it was the week before), I encountered a man driving his Honda Accord on the LFP at about 36th St. who clearly knew what he was doing. I informed the CPD officer I encountered at 31st St., and I hope they stopped him. I can’t recall the year, but maybe in the early-mid Aughts there was a driver who somehow ended up on the LFT south of North Avenue and hit a whole bunch of cyclists and pedestrians. I want to say the guy had a medical emergency and he pretty much lost control of the vehicle, I can’t dig anything up on it but I definitely remember it because I had biked that stretch earlier in the day. Last summer I’ve seen a lady in an SUV driving on LFP. Confronted by pedestrians she said she needed to pick-up her kids. She was very upset that people were calling police and told her to leave. I kid-you-not! I don’t remember whether that was a medical emergency or an elderly driver who got confused, or maybe there was one of each around that time. Access control is a good idea, but be wary of jumping straight to bollards. Trail bollards routinely maim and even kill cyclists — they’re small enough to be hidden by another trail user ahead of you, leaving mere moments to respond when that user swerves around a bollard they’ve been able to see for hundreds of feet. Even “properly” installed bollards constitute a serious and potentially fatal safety hazard to unwary trail users. In addition, no bollard layout that admits bicycles, tricycles, and bicycle trailers can exclude single-track motor vehicles such as motorcycles and mopeds. For these reasons, bollards should never be a default treatment, and should not be used unless there is a documented history of intrusion by unauthorized cars, trucks, or other unauthorized vehicles. I was on the DPRT near W Lake Ave heading north and I came across a driver going the opposite direction in a bmw. I have no idea where they came from, I was in the woods. I am not a big fan of bollards for the reasons you cite. Also, if you are using a bike trailer (e.g. hauling kiddos), they can be dangerous. Agreed that there should be preventative measures put in place. However, that wouldn’t prevent the daily scourge of Park District vehicles traversing the LFT and some of those drivers are insane! I’m surprised that there hasn’t been deadly encounters with some of these vehicles that I can attest are going 20-25 mph on the path. And… in most cases there’s absolutely no reason for them to be there. In almost all cases they can use inner roadways such as Simmonds Drive or roadways that parallel the park like Marine Drive. Same goes for the South Side. Yes, it would take a little longer, but SO WHAT! Safety is the issue here, not to mention the fact that the LFT is already congested enough. We certainly don’t need Park District vehicles making it worse. And… don’t even get me started on these jerks using electric bikes. If they can’t pedal then they should be out on the streets with cars! How often do you see an electric bike running on throttle? I’ve seen electrics (and I ride one), but the riders are pedaling. I’m honestly more worried about the electric skateboards. I’ve seen them outpacing everything on the trail (electric bikes included). I didn’t even know that accident happened! I also wonder how the crap he got onto that sidewalk, as well. Agree in principle but in a thought-through design, bollards (or any access limitation element) is placed at an intersection where automobile traffic is possible. With good design, these should already be forcing riders to slowly approach these areas. The devil is in the details but bollards are, in effect, the best option. The Dutch have a national safety campaign for removing bollards because of their crash risk. Intersections are one place that bollards are especially hazardous to cyclists, since the rider’s attention needs to be focused on intersection conflicts, not design hazards. FHWA multimodal network guidance specifically calls out the need to avoid bollards at intersections. Are these drivers that make it onto the path the most egregious example of entitled motorists or just plain stupid? I was taking a Sunday morning ride on the 606 a couple weeks back and a driver “got mixed up’ and ended up on there. Some kind cyclists were riding with her to guide her off of the trail but my head was spinning…how do you “accidentally” enter that path?! We set the bar to get a license entirely too low. events are rare, violent Muslim extremism is real. I’m sure that being nice to them and genuflecting to them will make them love the West all over again, which explains why, globally and domestically, Islamic terrorism went into a complete retreat during the Obama administration. Huh. John, the majority race in this country is white, so it should come as no surprise that a significant number of mass shootings have been perpetrated by white guys. Then again, Arabs are also white (Caucasoid) by most demographic assessments. One of the biggest incidents of mass violence was from an Islamic Muslim (Afghan), targeting a gay nightclub for those Western decadent ways. Another biggie was the Ft. Hood shooting and the San Bernardino shooting. Were those white guys? Well, no. One was a woman–a Muslim woman. I know that increasingly discredited organizations like SPLC and ADL have a narrative to feed, just as they have to keep funneling their data over to dishonest, declining media outlets like The Guardian and The Independent. But no amount of temporal “bookending” for dates will shroud the fact that the overwhelming majority of suicide attacks committed globally belong to a single religion. The ADL loves trying to make white supremacy the great bogeyman, by conveniently starting its count of “hate” incidents on September 12, 2011. Who do they think they’re fooling? Are you afraid that your Muslim friends won’t like you anymore if you call out Islamic terrorism? Isn’t it possible that they also are tired of a small but undeniably active minority aims to besmirch their entire religion? Almost exactly a year after this article was published, another crash on the LFT.